On 24 November, Victorians will go to the polls for another state election. Along with key election issues — such as major infrastructure projects, population growth and planning — heritage is high on the agenda for many communities across Victoria. As the state’s leading heritage body, the National Trust of Australia (Victoria)’s vision is that our diverse heritage is protected and respected, contributing to strong, vibrant and prosperous communities. Our natural, cultural and Indigenous heritage is irreplaceable and contributes immeasurably to our economy and social well-being. Protecting our heritage places requires leadership from all levels of government, as well as grassroots community participation and leadership. We have, therefore, called on candidates from major political parties to show their support for the future of our heritage, and share information with our members and supporters regarding their policies. In this 2018 election feature, we also follow up on the commitments that were sought by the National Trust leading up to the 2014 election, as well as outlining the challenges we currently face. We encourage all National Trust members to question their local candidates about their heritage policies and call for leadership on local and state heritage issues. A key issue raised by the National Trust in the lead-up to the 2014 election was the Heritage Act reform. While consultation on the reform of the Heritage Act 1995 began in 2015, resulting in the gazettal of the Heritage Act 2018, many concerns raised by the National Trust as part of this process remain unaddressed. In particular, the National Trust sought reform which would trigger automatic inclusion in the Heritage Overlay for places of demonstrated local significance if rejected for inclusion in the Register. While the Act provides the Heritage Council of Victoria with the ability to make recommendations to local government authorities, these recommendations are not binding. As a result, locally significant places continue to fall through the cracks. The demolitions of Frogmore (Carnegie, 2015), Ngara (Kew, 2016), and Forres (Kew, 2016) following rejection for inclusion on the Victorian Heritage Register provoked community outcry, leaving many residents wondering how these places could have been overlooked. The unlawful demolition of the Corkman Irish Pub (the former Carlton Inn) in 2016 also became a flashpoint in the heritage debate, provoking widespread discussion about the value of heritage to communities,and the strength of legislation in place to protect it. 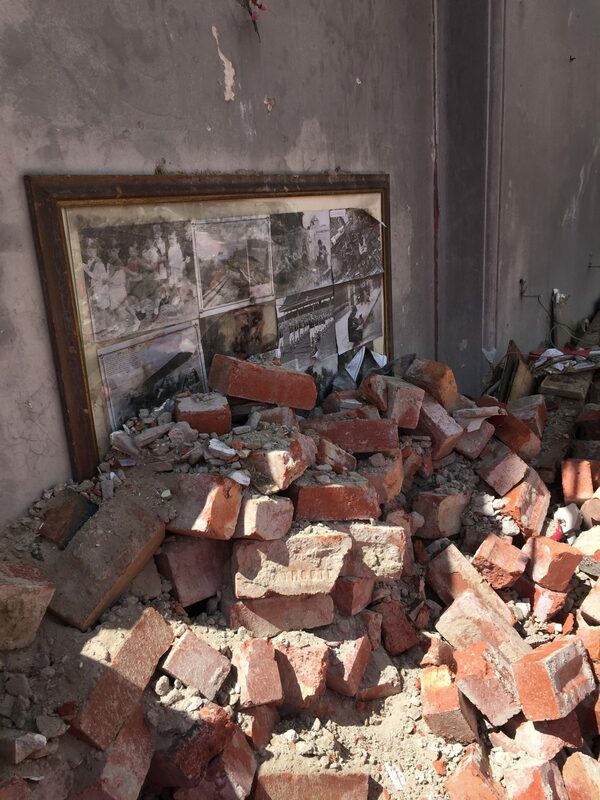 While the fate of the pile of rubble that remains on Leicester Street, Carlton, is still unclear, the incident swiftly prompted reform to increase the penalties for illegal works, including potential imprisonment. In 2014, as now, the National Trust recognised the urgent need to ensure councils are well-equipped to proactively identify and protect local heritage places before they come under threat, and called for a commitment to reinstate funding for local heritage advisory services. This relatively modest $350k program, administered by Heritage Victoria, was the backbone of heritage planning in local government, yet was scrapped in 2014. Despite an apparent rise in council requests for ministerial intervention to protect heritage places at risk (which is often refused, putting the onus on councils to proactively identify and protect heritage places), this funding has not been reinstated, with government heritage funding instead focusing on programs relating to places on the Victorian Heritage Register. While investment in our state-significant heritage places is welcome, gaps are now beginning to show in local government heritage protection, which in many areas of metropolitan and regional Victoria has not kept pace with development pressures and community values. We are once again calling on all parties to commit to the reinstatement of this funding in addition to providing resources for places of state significance. Prior to the 2014 election, the National Trust also sought a commitment from the major parties for a $50m restoration and activation of the Flinders Street Station administration building. We were delighted with the announcement in early 2015 of a $100m restoration project, which has recently seen the station returned to its original colour scheme and the dome restored — a dramatic transformation. The decaying ballroom remains off-limits however, with stabilisation works being undertaken but no full restoration planned. With the current restoration program now nearing completion, the National Trust continues to call for the preparation of a business case to inform activation of the ballroom and administration building. Finally, we asked for a commitment to a “Plan B” for the Point Nepean Quarantine Station, following a controversial Expressions of Interest process for the operation of the site in 2013–2014. Following an election commitment to review the lease entered into by the Napthine Government prior to the election, Parks Victoria initiated a review of the existing master plan for the site in 2016, which has now been finalised and adopted after an extensive process of community consultation. The revised master plan has been generally met with a positive reception from environmental and heritage advocates, with $3.7m funding provided for early initiatives, including the appointment of a Point Nepean Advisory Group reporting directly to the Parks Victoria board. In 2018, gaps in heritage protection at the local level remain a pressing issue. Following the withdrawal of state government funding for local government heritage advisory services in 2014, there has been an inconsistent approach across the state in the delivery of heritage strategies and preparation and implementation of heritage studies, particularly in urban growth areas and regional and rural Victoria. State government funding for local heritage remains a high priority for the National Trust’s advocacy agenda. While the Victorian Heritage Register includes approximately 2,400 places of state significance, Heritage Overlays account for more than 150,000 places. While some types of heritage are now relatively well protected — such as buildings dating back to the Victorian and Federation periods — less recognised types of heritage — including postwar architecture and places of social significance are — increasingly vulnerable. The unlawful demolition of the Corkman Irish Pub in Carlton and the demolition of the Greyhound and London hotels in the City of Port Phillip have prompted a re-think of how places of cultural significance are protected and managed. In 2018, we welcomed the commencement of strategic work by the Heritage Council of Victoria to investigate best practice for the assessment of social significance. Bayside Council’s recent backflip on a promised mid-century-modern heritage study for Beaumaris and Black Rock, home to a state-significant collection of postwar architecture, also demonstrated how a lack of leadership at the local government level — despite local and state planning policies that encourage the protection of heritage — can leave heritage places vulnerable to demolition, and communities with no recourse. Major infrastructure projects also continue to place pressure on built and natural heritage assets and public open space in both metropolitan and regional Victoria, with the Melbourne Metro Tunnel and West Gate Tunnel projects underway, the North East Link project in planning, and a potential Airport Rail Link, Suburban Rail Loop, and a resurrected East West Link on the horizon. In regional Victoria, the bungled Western Highway duplication project has highlighted the need for government agencies to adequately consult with communities and take into account impacts on vegetation and significant trees in proposed transport corridors. Railway station upgrades — including Ballarat and metropolitan stations impacted by level crossing removals — are also cause for concern. In the lead-up to the 2018 election, the National Trust of Australia (Victoria) has developed an advocacy platform based on three key pillars. We call on the state government to ensure that our special places are protected appropriately; that Heritage Victoria, the state government heritage body, is adequately resourced; and that funding for local government heritage advisory services is reinstated. We advocate for rigorous and systematic heritage reviews to inform heritage protection, with a strong focus on typologies that are not well protected — including postwar architecture, industrial heritage and places of social significance such as pubs and theatres. Public and private investment in heritage assets creates significant economic and community benefits. We are calling for a commitment to ongoing funding for the Living Heritage Program, administered by Heritage Victoria, to provide restoration funding for places on the Register, as well as new initiatives including investment in a revolving fund to support the protection and adaptive re-use of heritage places at risk. The National Trust calls on all levels of government to show leadership in the custodianship of publicly owned heritage places. In 2018, our focus is on the Mount Buffalo Chalet, which is managed by Parks Victoria on behalf of the state government. Despite a recent investment in conservation works to the front of the building, the Mount Buffalo Chalet has been closed for more than a decade and continues to languish. The Mount Buffalo Chalet is one of many government-owned heritage assets that is at risk, despite demonstrating great potential for activation. Matthew Guy just about destroyed our heritage when he was Planning Minister & was too friendly with developers! !